Pain in the armpits while doing push-ups or after you've done them is usually nothing more serious than what it feels like: a pulled or strained muscle or a pinched nerve. The pain may start with a sensation of tightening in your armpit and gradually progress to a sharper, more distinct ache. A deeper look into the specific muscles, ligaments and tendons at play in the armpit may help you find the right course of action for quick recovery and avoiding future injury. The armpit, more technically known as the axilla, is the space beneath the shoulder where nerves, vessels and a variety of muscles converge from different directions like a big freeway junction. In front is the pectoralis major, in back are the latissimus dorsi, subscapularis and teres major, and coming in from the chest wall is the serratus anterior. With so many muscles converging in so small a space, there are short odds that if you strain just one of them, you're likely to feel it in your armpit. The strain may occur in one fell swoop, or it may be the result of repetitive activity. And although you may feel the pain most when you're doing push-ups, that doesn't necessarily mean that the push-ups are actually causing the pain as much as revealing it. If it's a dull ache or minor pain, you can problem deal with this yourself. Apply ice or cold packs to the painful area for the first 24 to 48 hours. Over-the-counter anti-inflammatory meds such as ibuprofen (Advil, Motrin), aspirin or naproxen (Aleve) can help tame the roar and promote healing. And you might have to back off training for a while to let the area heal. Lying beneath the biggest chest muscle, the pectoralis major, is its little brother, the pectoralis minor. It's good to know about junior, because when this much smaller muscle is well-toned, it adds definition to the chest beneath the pecs. However, the little guy is also prone to tightness, especially if you're sitting at a desk a lot of the time. Regular doses of push-ups can cause tightening of the pec minor, too. And when little brother is too tight, he's gonna put the hurt on you. A tense pectoralis minor muscle is quite capable of entrapping nerves in the axilla, leading to all kinds of discomfort. Arm-pit pain as well as other symptoms of a problem pec minor include shoulders rounding forward, a burning or stabbing pain in the chest, pain when breathing. The solution in this case is to do stretching exercises for the pectoralis minor that counteract tightening of owing to push-ups and other exercises that are otherwise good for you, such as the doorway chest stretch and the towel chest stretch. 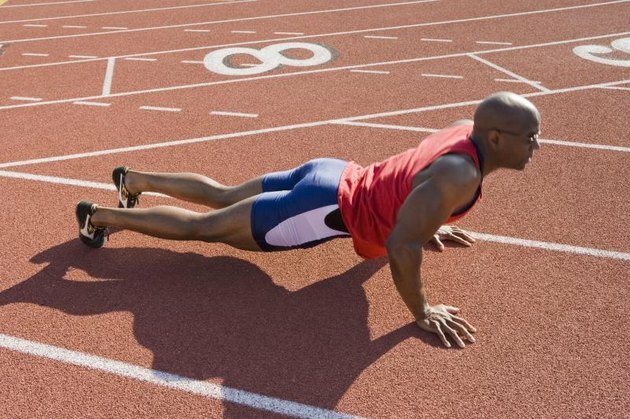 Read More: Why Am I Sore After Push-Ups? What Happens If You Do 30 Push-Ups a Day?